Fireproof 4-Drawer Card, Check and Note Vertical File Finish: Sand, Lock: Key Lock by FireKing at Momiji Studios. MPN: 4-2536-C (sand). Hurry! Limited time offer. Offer valid only while supplies last. 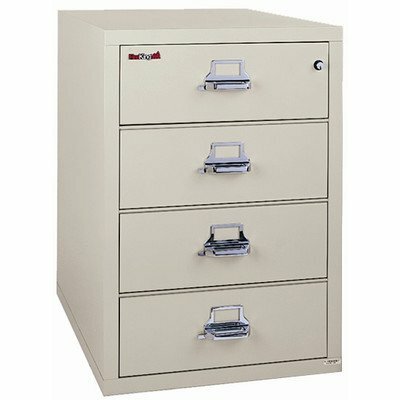 4-2536-C (sand) Finish: Sand, Lock: Key Lock Features: -Two-position drawer catch allows access to certain drawers while others remain locked. 4-2536-C (sand) Finish: Sand, Lock: Key Lock Features: -Two-position drawer catch allows access to certain drawers while others remain locked. -Insulation between all drawers makes each one a separate insulated container. Product Type: -Vertical filing cabinet. Style: -Traditional. Locking: -Yes. Primary Material: -Metal. Number of Items Included: -3. Commercial Use: -Yes. Fire Resistant: -Yes. Drawers Included: -Yes. Number Of Drawers: -4. Drawer Type: -Letter. Country of Manufacture: -United States. Dimensions: Overall Height - Top to Bottom: -36.19". Overall Width - Side to Side: -25.25". Overall Depth - Front to Back: -31.56". Overall Product Weight: -706 lbs. Specifications: GSA Approved: -Yes.